Latest post Wed, Jan 30 2019 12:33 AM by Job ter Burg. 22 replies. It's probably a bad idea, but I was thinking of adding a hi-fi surround system in my editing suite. At the moment I have a pair of studio monitors (Yamaha HS5). But for screenings, I would like to have surround sound. So I was thinking of using a home theatre receiver with some good hifi speakers (Monitor Audio 'Monitor series or Klipsch 'RP-250'). Another option would be to expand my Yamaha set with 3 extra speakers (HS8) and a subwoofer (HS8S). But how do you best connect those? It's probably not possible with just a receiver. Now I use a Blackmagic UltraStudio Express. The advantage of using Hifi speakers is that they don't need to be switched on separately. But the question is mainly whether the sound will not become too colored, and therefore will not give a correct reproduction of the soundtrack. What is the best hardware to switch between my 5.1 and 2.0 setup? It depends on whether or not you're mixing or mastering. For mixing you tend to use flat response speakers. But for mastering you want to hear what it's going to sound like at the client's end, so you want a good set if hifi (audiophile level) speakers. For me, I prefer to edit audio and video on components which are typical for my clients. I don't have a perfectly color calibrated reference monitor. I use a reasonably calibrated UHDTV typical of what an end user will have. My speakers are typical home theater speakers, which given that most of my clients are probably still using the speakers in their TVs is better than what they're really hearing. If you're producing something for cinema, then that changes things a lot. That's where you need a color calibrated monitor, and speakers capable of accurately producing the highs and lows of a theater system. If you've been editing in stereo, what is the purpose of adding the surround sound speakers? Do you have sufficient audio source to make surround sound editing worthwhile? What is the end product you're producing? Event/corporate video, broadcast, cinema, etc.? There's HT PreAmplifiers that have HDMI inputs and balanced XLR outputs. I use one as my 'monitor controller'. Audio in over HDMI, using the preamp for main volume as well as for lipsync delay. Those preamps are not always cheap, but used ones can be had for a few hundred Euro's, and the older ones will suffice if you just need HDMI in and XLR out. Would you cut/mix in 5.1 (I do that), or would you rather just add a ProLogic matrix decoding to your stereo mix? I'm editing for broadcast and cinema. I'm not mixing for final mastering, but of course I always do some temp mixing. And I would like to cut/mix in 5.1. I would like to be able to switch easily between a stereo setup and a surround setup. Also for video monitoring it would be nice to be able to switch between my Eizo monitor and a projector. So According to you it's not a good idea to use Hi-fi speakers? Wich preamp do you use? Or do you have any sugestions? I would like to be able to switch easily between a stereo setup and a surround setup. As in two different sets of speakers? If not, you can simply set up 5.1 monitoring, and switch to stereo with a mouse click in MC's Mixer Output. MC will even fold down your 5.1 mix to LoRo (stereo) for you on the fly. The idea is that you send either stereo signal or a 5.1 signal to the receiver over HDMI. Stereo would be L/R, 5.1 would need to be set to SMPTE order (in your Avid Mixer Output), which is L/R/C/Lfe/Ls/Rs. No rewiring needed, as L and R stay on the same channels. That said, you may need to be aware of the I/O device you use. My AJA T-TAP sends the 5.1/7.1 out correctly over HDMI, as do the Avid branded boxes as far as I know, but my BlackMagic Mini Monitor does not. It has Center and LFE flipped (as SDI has a different 5.1 channel order than HDMI). Same seemed to apply to any othe BlackMagic Design branded boxes. Why would you? They won't match your other speakers, and that seems to me to already be problematic. Wich preamp do you use? I run a Marantz AV8003. Other options would be the Marantz AV7005/8801/8802/7701/7702/7703, the Onlyo 5508 and 5509, which seem to be the same machines as the Integra 80.2 and 80.3. Yamaha has the CX-A5000 and CX-A5100. Some of these are older models. I used to use a Denon A7100, but that would not accept the 7.1 signal my T-TAP and Nitris DX send out (even when monitoring 5.1), so I switched to the Marantz. True, if I use Hifi speakers, I can't use the Yamaha speakers anymore. But it's rather a budget issue. An amplifier that has XLR outputs just costs a lot more. An other advantage is that passive speakers are easier to position in my room and they don't need to be switched on separately. So that's why I was wondering if this was a good solution. Do you use the Marantz also for video out? I actually don’t route the video through the Marantz because of some weirdness with color space settings when using my SDI -HDMI converter. Used, you can find those Marantz receivers for 400 euros or so. If you prefer passive speakers for ease, I’d recommend trying to find passive pro monitors rather than anything hifi. Okay thanks a lot for the advice. What do you use for your video then? Do you have audio delay? And if so, is it easy to adjust? The Marantz has a very simple to use LipSync feature. So I've measured the delay of my OLED screen (using a Sync-One-2) and then set the delay for audio (in the Marantz) and source/record monitor (in the Console) accordingly. Ok, now this is really off topic, but do you prefer a OLED screen over a projector? Yes, because I don't want to work in a dark room all day. I've considered adding a projection screen (as fellow editors have done), but I never really do screenings in the cutting room, I prefer going to an actual screening room with a Barco/Sony/NEC DCI projector. Okay, now that I have found a preamp for my 5.1 setup (Marantz AV7702) it is time to look for speakers. My first idea was to expand my Yamaha HS5 set with 3 HS8's (Front left, right and centre) and 1 HS8S (subwoofer). Is this a good idea? When reading some reviews, a lot of people say Yamaha is not the best option out there. So maybe it's better to start with a whole new set and sell the HS5s. I was thinking of the Adam AX series. Is it possible to use the A7X as front left and right, and the A77X as center speaker? As surround speaker, I would take the A5X, or maybe even the A3X. Or is that one too small compared to the A7X? An other option is 5x Genelec 8030CP + Subwoofer (7050CPM). Has anyone any thoughts on this? All other suggestions are welcome! The Yamaha's are not considered to be great speakers, compared to some of the other options our there. But the best advice I was given about this was to set a budget. There's a world of affordable active speakers out there, with minor and bigger sonic differences, and some folks will tell you one sounds like crap and the other sounds great, and the next person will disagree completely with those assessments. Last year, I auditioned a set of Genelec 1031a's and a set of Dynaudio LYD48's. Three sound mixers came by, and after a 10 minute session, one of them found the differences extremely sublte, one vehemently preferred the Genelecs, the other vehemently preferred the Dynaudio's. I've stuck to used Genelecs from the old 103X series, 3x 1031 as fronts, 2x 1030 as rears, and a 7060B sub. In the lower buget range, a lot of folks love the JBL LSR305 or 308, and I think they are generally considered to be better performers than the Yamaha's. JBL also makes the 705p and 708p, much prices, but they are considered to be great. I see a lot of the newer Genelec series everywhere, and people like them. Dynaudio is very popular too, although their current LYD series is a bit more budget than their previous BM and Air series were. I have an old Adam A7 set somehwere in storage, that I used on a second mobile set somewhere. They were very much loved in the music scene for a wile, but I still preferred the Genelecs. Then there's PSI, Neumann K&H.... etc. I'd definitely consider narrowing it down to two or three brands and audition them before you buy. And you might want to consider picking up a used pair of speakers for a much better price than a whole new set. Also, whatever money you may save buying used speakers, you should consider investing in room treatment. No matter the speakers you get, if your room sounds like sh*t, it'll be a waste of money. You can either get packages from companies like GiK Acoustics (can already help a great deal), or you can bring in a specialist (and then have them set you up within a budget range, as this can take anywhere from a few hundred to a few hundred thousand EUR). Ok. So now I have a last question. Maybe one I should have asked in the first place, but I didn't think of it. Are nearfield speakers the best option for me? I will have a setup in which I will be 4,00m away from the speakers. Is this doable with nearfields? Or should I be looking for some midfield speakers such as the LYD48s you we're talking about? If nearfields are okay I'm thinking of Neumann KH120 or Genelec 8040. I would not recommend nearfields in that siutation, no. One of the reasons I only briefly used a setup similar to the one you have drawn (in a room 4mts wide and 7 mtr long). While it's possible to use nearfields, it's far from ideal, both for speaker placement as well as for my own distance to the main screen. Also note that you'll sitting very close to your surround speakers. Ideally, for a studio environment, you'd place the speakers in a circle around you, each at the same distance from your hot spot. 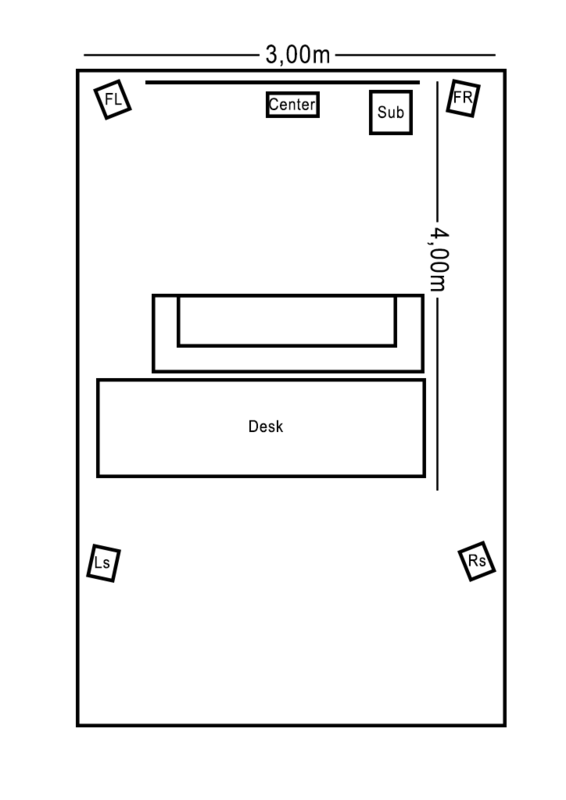 Wouldn't you consider moving the desk further to the center of the room, putting yourself about 2 mtrs from speakers and screen, and putting the couch in the back of the room (raised on a platform if needed). Added advantage would be you might be able to move the L and R speakers a little more to the center, away from the walls (as that is likely to be problematic). Another thought about projection: you could put an OLED or QLED screen on the wall, and attach an electric rolling projection screen from the ceiling that could fall in front of it. That would let you switch between regular screen and projection. P.S. : Are you in Holland? If so, I could recommend a very good acoustic advisor here, who can work within most any budget.